Amazingly easy to use cooking app that features recipes for grilled, baked and smoked salmon, casseroles, appetizers, soups and salads. The recipes are searchable by name and searchable by ingredient, allowing you to build an exciting menu around the food items that you have on hand. 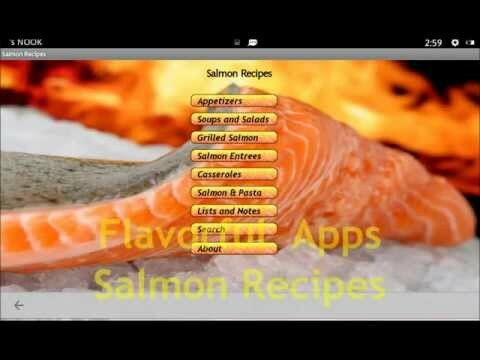 This application is amazingly compact because it utilizes a miniature built-in database to store recipes. This means that you do not need internet access to use your app! This can be very handy if you are traveling or do not have good internet reception in your cooking area. 45 Popular appetizer recipes including Gravlax, Lox, Salmon Mousse, Salmon Party Dips, and Salmon Pate. 17 Salmon casseroles including Salmon Loafs, Salmon Dijon, and more. Over 100 entrees including Salmon Parisienne, Baked Salmon, Glazed Salmon, Salmon Hollandaise and many others. 26 Grilled salmon dishes including Salmon Burgers, Barbequed Salmon, and Planked Salmon. 25 Pasta dishes including Salmon Fettuccine, Salmon Manicotti, Salmon Spinach and Cannelloni, and Salmon Lemon Penne. 20 Soup and Salad recipes including Salmon Chowder, Salmon Soup, and Salmon Salad. You will love our salmon recipes and our exciting application features. FlavorfulApps.com does not collect or retain any personal individul data on your use of our apps.